Mineral Bath Soaks from Pre de Provence | P.C. Fallon Co. Rejuvenate your senses and soothe your muscles with these mineral-rich bath of aromatic Sea Salts from the Mediterranean Sea. For a truly authentic experience, some Pre de Provence Baths have some of the same tiny visible bits of blossoms and leaves found in the Shea Butter-enriched bar soaps. All Pre de Provence products made in France. 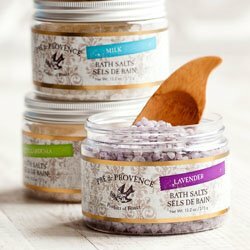 Choose from Pre de Provence Bath Salts in authentically French fragrances including best-selling Lavender, along with Verbena, White Gardenia, and Milk. Eaux Fraiches Mineral Bath Soaks have a wonderfully relaxing, spa-like scent. All Pre de Provence products are proudly made in France.